In this exquisitely written book by the author of A Paradise Built in Hell, Rebecca Solnit explores the ways we make our lives out of stories, and how we are connected by empathy, by narrative, by imagination. In the course of unpacking some of her own stories—of her mother and her decline from memory loss, of a trip to Iceland, of an illness—Solnit revisits fairytales and entertains other stories: about arctic explorers, Che Guevara among the leper colonies, and Mary Shelley’s Dr. Frankenstein, about warmth and coldness, pain and kindness, decay and transformation, making art and making self. Woven together, these stories create a map which charts the boundaries and territories of storytelling, reframing who each of us is and how we might tell our story. Writer, historian, and activist Rebecca Solnit is the author of seventeen books about environment, landscape, community, art, politics, hope, and feminism, including three atlases, of San Francisco in 2010, New Orleans in 2013, and New York in 2016; Men Explain Things to Me; The Faraway Nearby; A Field Guide to Getting Lost; Wanderlust: A History of Walking; and River of Shadows: Eadweard Muybridge and the Technological Wild West (for which she received a Guggenheim, The National Book Critics Circle Award in Criticism, and the Lannan Literary Award). She is a columnist at Harper's and a regular contributor to The Guardian. She lives in San Francisco. "In her famously lyrical prose, Solnit writes about her own life, her family, and her reading, and she revisits the myths and ideas from art and history that have shaped her world." "What Solnit offers us, I think, is the future of memoir. Not the story of the self . . . but the ways in which one's story opens into other stories . . . literary nonfiction doesn't get more beautiful and compelling." "A beautiful and profound book of essayistic reflection on memory, family, grief, travel, and storytelling." "The product of a remarkable mind at work, one able to weave a magnificent number of threads into a single story, demonstrating how all our stroies are interconnected." "[A] brilliant, genre-refuting book. 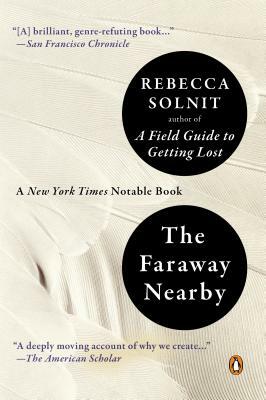 The power of The Faraway Nearby, as in Solnit's previous writing, lies in its juxtaposition, its clusters of narrative nerves. . . . Solnit is a wanderer who collapses distance."